HP’s c-Class BladeSystem solutions offers simplified management, unparalleled scalability with resource pooling, and flexible networking options. Blade servers offer lower costs per server compared to rackmount servers, as well as lower power consumption, lower airflow requirements, and reduced and simplified cabling. With support for server blades from G1 to Gen9, your investment is protected. A flexible, modular system means you can upgrade your blade servers as your business or application needs change. 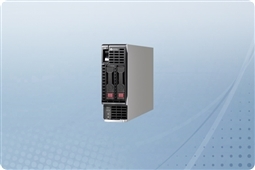 HP’s BladeSystem c-Class solutions start with the BladeSystem c7000 Enclosure. A 10U enclosure, the BLc7000 shared infrastructure includes up to six hot-plug, redundant power supplies, a three-phase or single-phase power input module, up to ten hot-plug, redundant Active Cool 200 fans and an optional redundant BladeSystem Onboard Administrator module. A BladeSystem c7000 Enclosure holds up to sixteen half-height server blades or eight full-height server blades. Up to four redundant interconnect I/O fabrics (Ethernet, Fibre Channel, InfiniBand, iSCSI, SAS, etc.) are supported simultaneously within the enclosure via up to eight interconnect modules. Half-height server blades options at Aventis Systems include the flagship BL460c G1, G5, G6, G7 or G8, or the BL465c G1, G5, G6, G7 or G8. 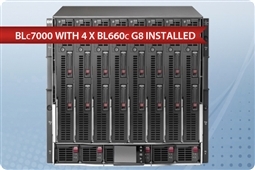 Full height blade servers include the quad-processor BL680 G5 or G7. Aventis Systems offers standalone blade server options for ultimate server-by-server customization, as well as populated BLc7000 chassis with interconnect options for a complete BladeSystem solution. Are you looking for shared storage for your HP BladeSystem? Please consider our selection of HP Modular Smart Array SAN solutions. Not sure where to start? Please call 1.855.AVENTIS or email Sales@AventisSystems.com for a custom quote from our knowledgeable sales team and presales engineers.